Of Kitchen Cabinets……Was There Any Change???? 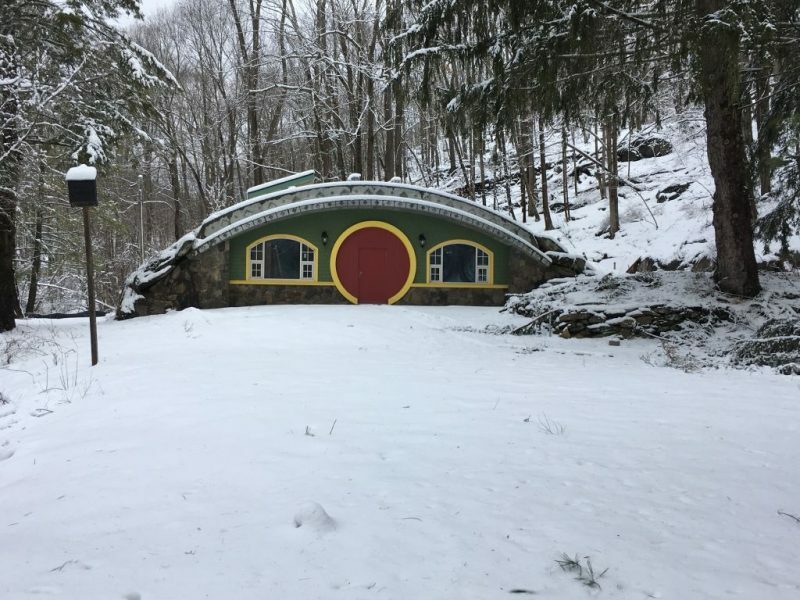 The Hobbit House after the recent Nor’easter. Welcome friends of Middle Earth and those interested in the ways of Hobbits and their dwellings! Good to have you all back! 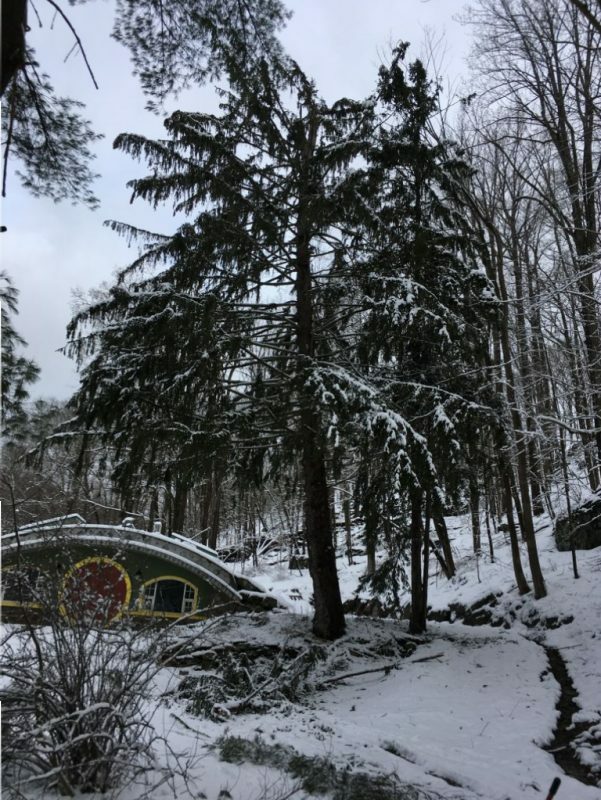 Yeah we dodged one over at the Hobbit house this last storm for sure. A lot of people still without power all over the Northeast. Trees down everywhere. As a matter of fact there’s a huge tree down about a half mile down the road from my own house that’s leaning heavily on the electrical lines. Hopefully the lines will hold. A lot of people are still without power. Lost the top of a pine tree over at the Hobbit. Check it out. Top of the pine tree came off and laded where I usually park. Quite a mess. Not nearly as bad as some people got it though. I thought this storm was going to be mostly rain. I was worried about soil erosion so I dug a little gully along the side of the hill to divert the water. I’m supposed to be getting a price to make something permanent for the property. We’ll see what my guy comes up with. Check out what I did. 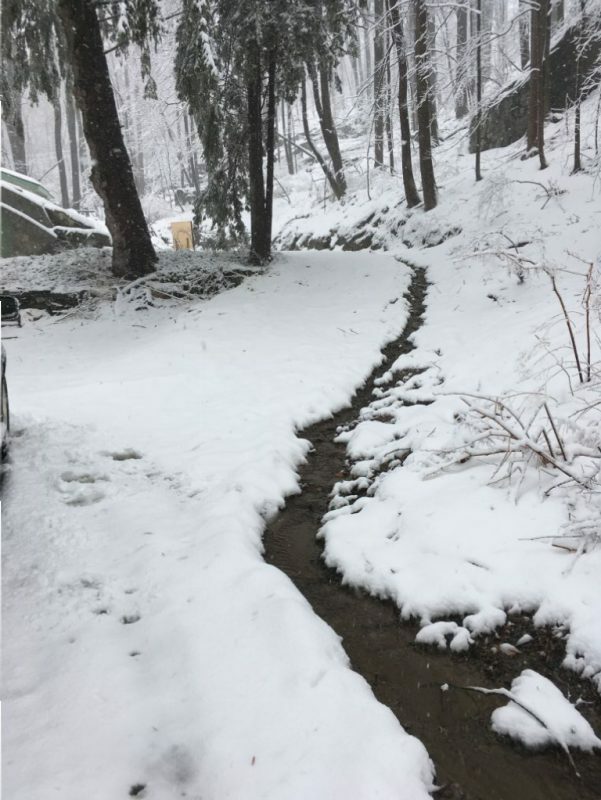 Diverting the water around the lawn as it comes off the hill. A nice little stream of water is flowing there. I should have set this up a while ago. A quick unrelated item before I get going. You ever notice that when you give somebody money to go pick up a pizza or get a couple of sandwiches at the deli you always have to ask if there was any change? I think I mentioned this way way back in a blog once before. But it’s annoying no matter how many times it happens. We order a pizza and a meatball parm wedge Sunday night. I give Ethan 40 bucks and I get nothing back but a blank stare. Then when I ask if there was any change I get the big smile and laughter. What’s up with that???? It never fails. And he’s not the only one. When I call Jude out about the change he makes a face like I should be forking over the extra $10 to him because he’s such a swell guy. Amazing I tell ya, simply amazing. It’s bad enough I have to feed these goons but then having to wrestle the change away from them is nuts! So I got a bunch of little stuff going this week. First off I didn’t do such a great job sheet rocking the arches into the kitchen. I had to wet the sheetrock down and then bend it. It came out okay. I was thinking that the taper would be able to fix it nice. It didn’t come out the way I wanted it to so I got the flexible plastic corner bead that you glue on and made it nice. It’s pretty easy to use and now I have a nice smooth curve to look at. 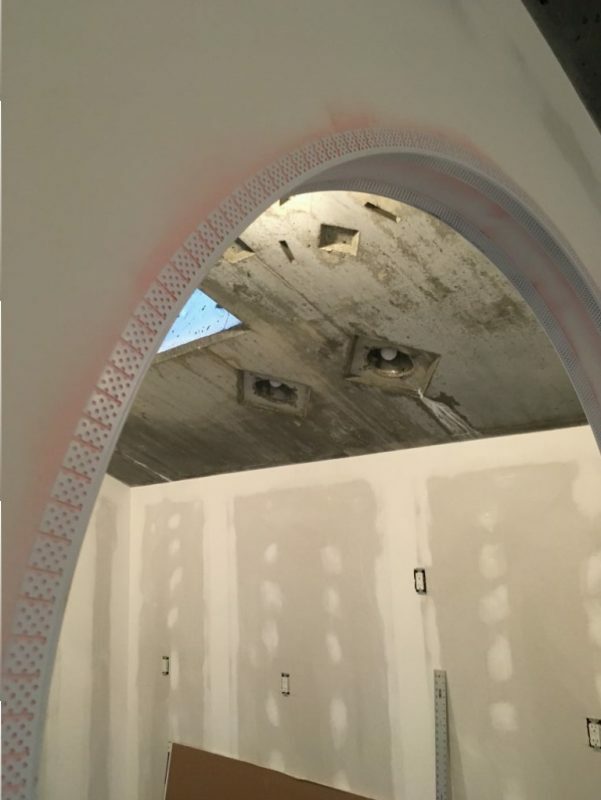 Redid the arches with plastic corner bead. 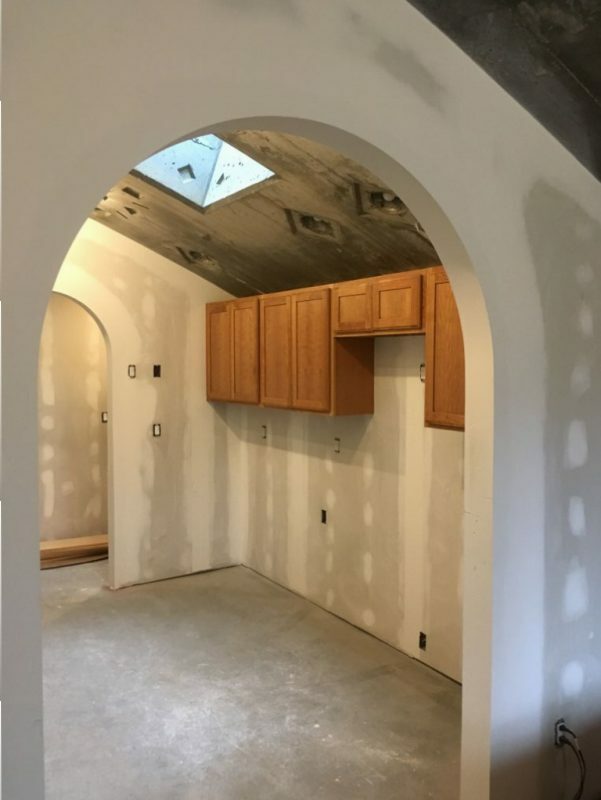 You use a spray glue and spray the sheetrock and the bead, then wait about 4 minutes until it’s tacky and push it into place. 1-2-3 done. Now I just have to retape the arch. Oh well. At least it looks good now. I also did all the exterior trim work on the North side of the house. Pretty time consuming. Especially the little window. 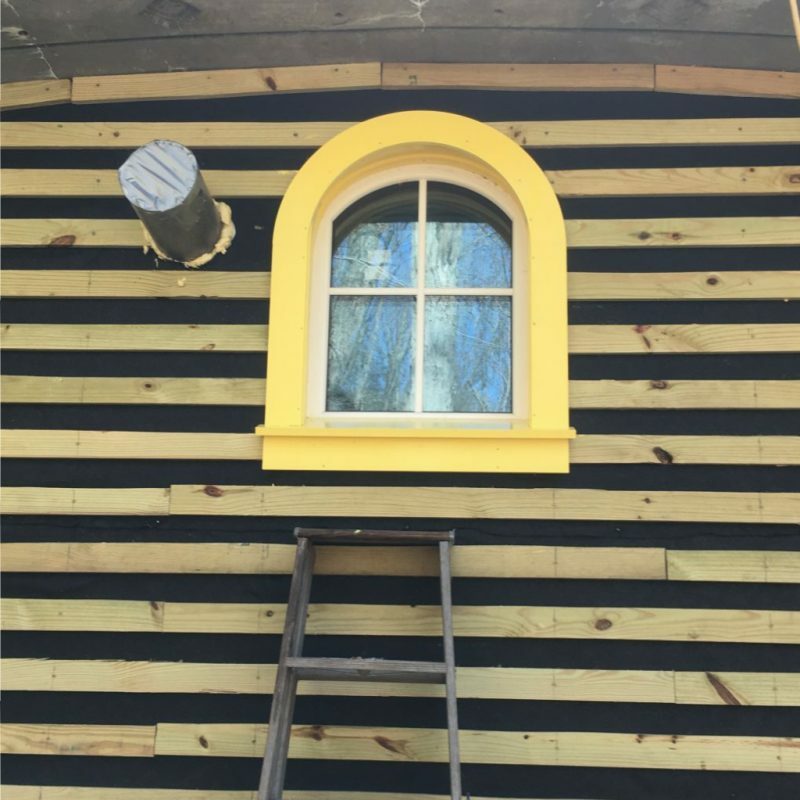 I had to make my own moldings for that window. I had a piece of Azek 3/4 left over from the front door which worked out really well. It took the better part of a day to trim out this little window. When I started I really had know idea how I was going to do it either so there was quite a bit of a learning curve to do this. Check it out. Setting up to cut the window trim for the back window. That pipe coming out of the house to the left of the window is the fresh air supply for the house. The trim came out nice though right? All Azek. Zero maintenance. Trimmed out the other two bedroom windows as well. I thought I took a picture with everything done. I guess I didn’t but you get the point. 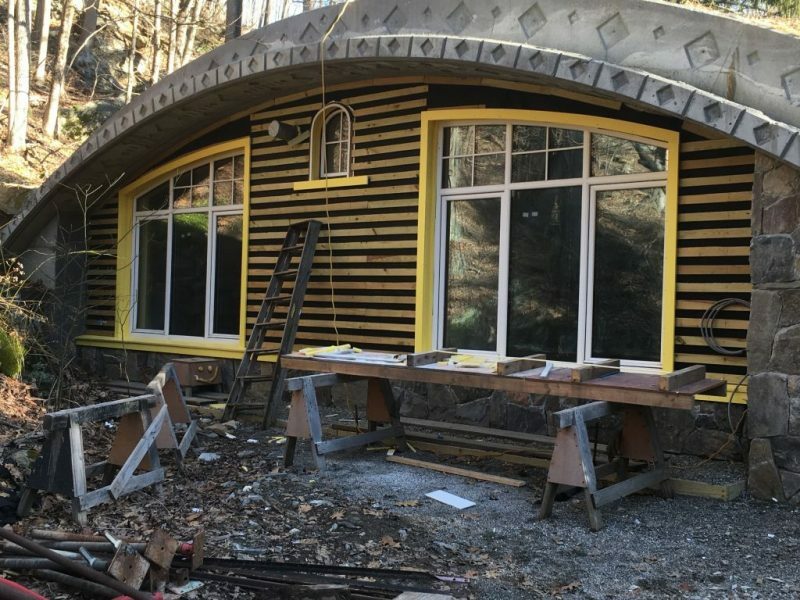 I’m looking to start the siding this week so I can wrap up the outside of the house. Have to see what the weather brings. 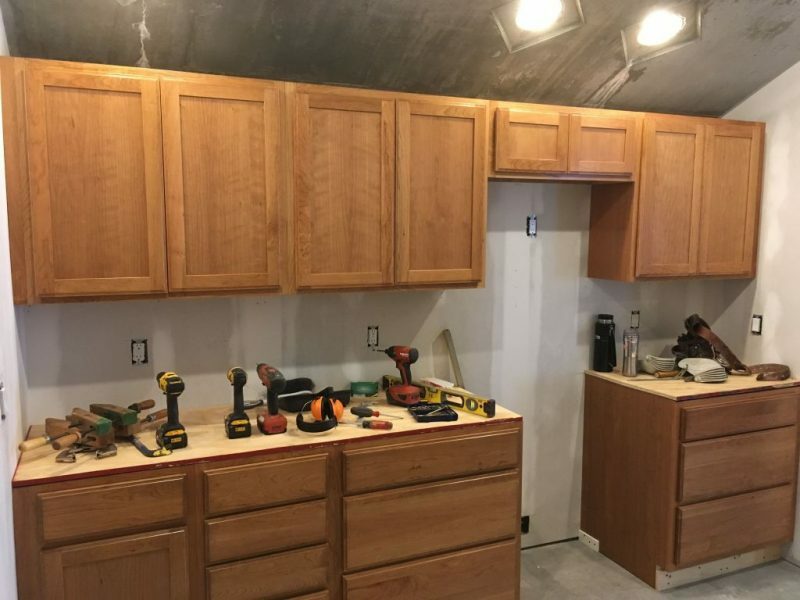 Like you guessed I started the kitchen cabinets Thursday afternoon. Got quite a bit done by Friday. 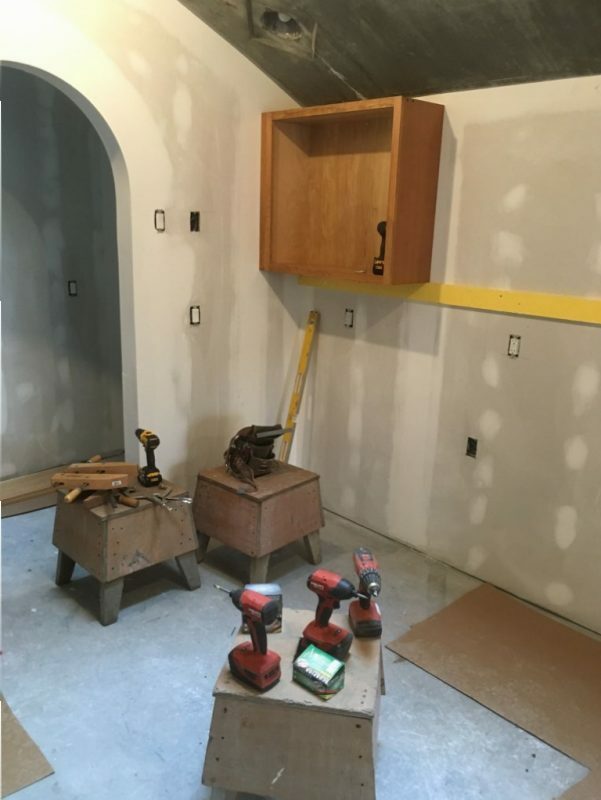 Cabinets are always a slow process though. You need every tool in the book at one point or another and you really have to slow down and take your time. It’s nice seeing a finished product going up on the inside. It makes it feel like a real house. A few pictures. 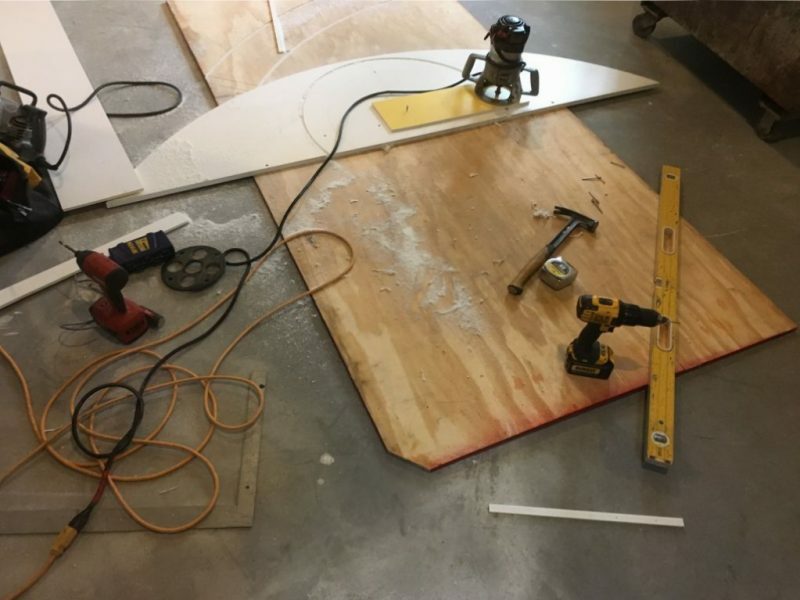 I used a piece of plywood for a countertop. Now I have a spot to put my coffee cup. The range and the microwave go in the empty spaces. 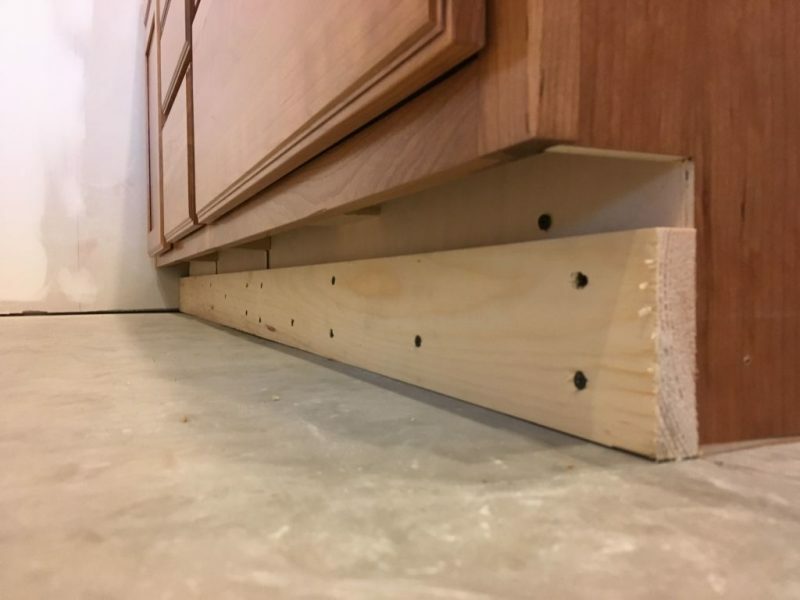 Additional 1×4 pine under base cabinet kick plate. I never like to trust the shims on base cabinets. What if they move? Unlikely but what I like to do is put a continuous support that ties the whole thing together as well. This will get covered with a veneer strip I’m going to put on later. Forgot to take pictures of the other side of the room. I’m hoping to have all the cabinets installed Monday as long as I don’t run into any serous issues. I ordered the bluestone for the path up to the roof. Should be here in two weeks. Hi John. Yeah we got clobbered but luckily we didn’t lose power. How’d you do? My in laws were out for a full week. I’ll have pictures in this weeks post.